No matter the industry, if you are a member of a Quality Affairs team, you know that a Corrective and Preventive Action (CAPA) system provides a wealth of information regarding the quality of your organization’s products and processes. However, few companies fully leverage the power of this tool to realize its positive impact to the bottom line. For instance, it is commonplace for a CAPA to be initiated for each nonconformance or deviation, or product quality-related complaint or audit finding, regardless of scope or severity. Despite intense regulatory pressures, though, not every one of these circumstances should necessarily trigger a CAPA. The “everything is a CAPA” syndrome is both costly and time consuming. Over time, the system becomes laden with records of varying degrees of severity, which are often vetted by issuance order rather than priority. As a result, the organization cannot optimally allocate resources to correct events that have the most impact on the business as a whole. So then, how can a company reclaim efficiency and perhaps even streamline the CAPA process? By quantifying risk, companies can more quickly realize a return on investment for their preliminary data gathering and work during the CAPA process. First, while it must be noted that there is no standard definition for risk that can be applied across organizations, the common goal is to mitigate risk, and for those that cannot be eliminated, to reduce them to a level as low as reasonably practicable. Many companies spend plenty of time and money putting risk metrics in place that are at best subjective based on their level of tolerance. This leads to inconsistency in the response to negative events. By quantifying risk, companies can more quickly realize a return on investment for their preliminary data gathering and work during the CAPA process. Risk assessment (or impact assessment) is required for any CAPA process and involves the identification, analysis, and prioritization of risks, and the subsequent application of effort to minimize, monitor, and control the probability and/or impact of a negative outcome. First, review historical data to determine risk attributes, frequency, and impacts. From this information a company can clearly determine its baseline risk exposure as well as its appetite for risk (risk tolerance). Second, quantify the risks and impacts using an agreed-upon methodology. Next, plot a 2 x 2 matrix (probability versus severity) to focus on the high-risk and high-impact category. This risk matrix becomes a tool that allows you to determine the corresponding actions to events based on those criteria, including no action if it falls within the acceptable risk category. Further, for events that required action based on its risk rank as defined by the matrix, an effectiveness review becomes more analytical since a new severity (in light of mitigation strategy employed) and frequency can be measured to produce a follow-up ranking. In Life Sciences, where patient safety is foremost, quality-related risks must be addressed swiftly and systematically. Use of a matrix approach can, therefore, allow certain activities to be triggered automatically such that the quality of the product is adequately protected, while resources can be returned to the business of innovation and helping patients. 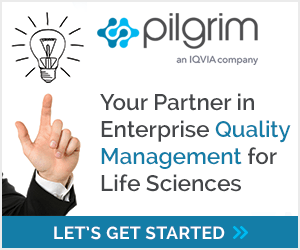 SmartSolve® CAPA Management, from Pilgrim Quality Solutions, helps Life Sciences organizations like yours develop a risk-based, streamlined problem resolution process. CAPA Management software provides user-friendly tools that enable you to adopt a risk-based CAPA process. Once you’ve defined your CAPA practices, the software automatically adjusts its workflow based on failure type, product, or other defect information. You can be confident that high-risk problems will be assigned to the right team members for action each time they arise. Choosing an effective CAPA risk management solution that enables an efficient CAPA process will, at the end of the day, will go a long way toward fulfilling the drive for continuous improvement within your enterprise. This CAPA Management e-book educates you on how a rigorous, risk-based CAPA process can improve patient safety and more.